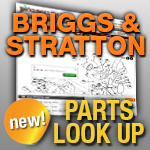 Briggs and Stratton Maintenance Kits: Jack's is your Place! We have the Maintenance Kits you need, with fast shipping and great prices! For small engine parts and accessories, think Jack's! Ariens snow blower maintenance kit. (Briggs & Stratton Engines) Includes Ariens 5W30 Oil, Champion RC12YC Spark Plug, Fuel Stabilizer and replacement ignition key. Contains filter 5043; service part 491588; contains spark plus service part 802592; contains fuel stabilizer service part 100056; contains oil service part 100005. Vanguard V-Twin 12.5-21 Gross HP Tune-Up Kit Contains Oil, Oil Filter, Air Filter, Pre Cleaner, Spark Plugs, Fuel Stabilizer, and Fuel Filter. Oil bag has been omitted in this kit by Briggs & Stratton.